Probably the only time you should let a child play with Plutonium and Arsenic. Each colourful block features six element images accompanied by their atomic number, symbol, and name. Korean: Expand your knowledge of Korea and the Korean language. This hand crafted 32 block set features Korean language symbols. Enjoy the animal pictures paired with their English translation. Let your fingers linger on the two debossed sides per block. Enjoy a bouquet of 14 exquisite flowers. One side of each block reveals a close up of the flower featured on its opposite. Colourful Art Nouveau letters grace the remaining sides. An educational toy for those who use American Sign Language to communicate. Touch the two embossed sides on every block of this 28 block set. Two debossed sides feature a planet’s symbol, name, and number of moons. The four printed sides reveal a planet illustration, diameter, location, and distance from the sun. See 16 constellations. Two debossed sides present the constellation with and without lines. Four printed sides feature a constellation symbol, name, hemisphere, and scale of magnitude. Teach children aged 5-7 words by sight. Each colorful block features two debossed sight words. Four remaining sides contain more sight words printed on a familiar notebook pattern. Play with these blocks at home or in the K-2 classroom. 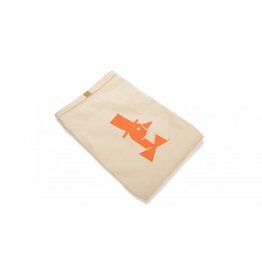 Canvas bag for all block sets. Imprinted with the Uncle Goose logo on heavy duty canvas. A great storage option! This Uncle Goose set features naked basswood cubes with 2 lower case letters embossed on opposing sides. They come in a plain design, putting it in your hands to decorate them however you like... so get out the paints and go crazy.